Asbestos is a general term referring to six fibrous, silicate minerals. It’s a very abundant material on Earth, estimated to be present in two-thirds of all the planet’s rocks – which is why it used to be so prevalent in thousands of products. Because asbestos is also heat-resistant, corrosion-resistant and offers high tensile strength (not to mention that it’s easy to manufacture), it became a popular material to use in products such as brake pads, roofing tiles, insulation, ceiling tiles, vinyl floor tile, and thousands of other products. In fact, in the mid 1970s, some 750,000 metric tons of asbestos was being imported into the U.S.. Today, there’s about 125,000 metric tons entering the country each year. When people hear the word “asbestos” or come to realize that they may have asbestos containing materials (ACM) in their home, their natural instinct is to want it removed immediately. While that’s certainly a possibility, it’s important to know that ACM left undisturbed is generally safe and non-hazardous. It’s only when the material is disturbed or “friable” that a health risk is possible. One of the main consequences of exposure to asbestos fibers and dust include is mesothelioma which is a type of lung cancer. If asbestos dust or fibers are ingested, gastrointestinal cancers can be also be the outcome. It’s estimated that about 10,000 people in the United States die annually from asbestos-related illnesses. In many cases, these deaths are preventable. All it take is people knowing what to do when they’re faced with a potentially hazardous situation. Simply put, they should leave it alone and call the professionals for assistance. Is Asbestos a Problem in Your Home? 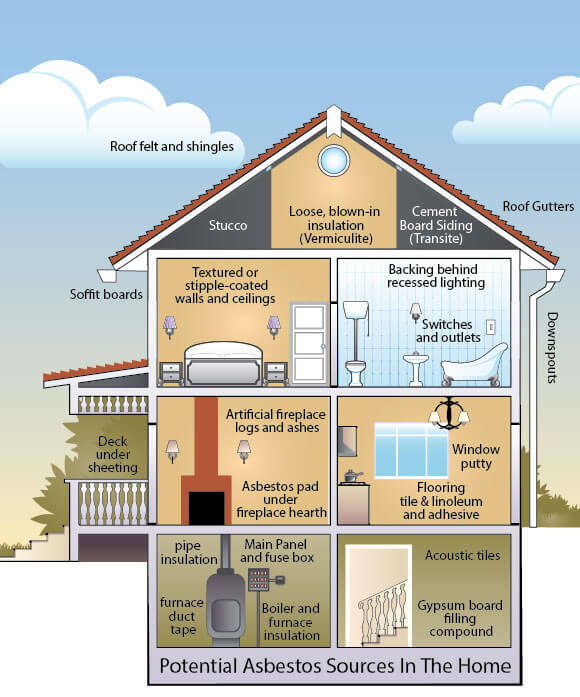 When might you encounter asbestos in a home? If your home was built before 1970, the chances of it containing asbestos are higher, whether it be in the basement floor tile, drywall, ceiling, or roof tiles. If you’re ever in a situation where you’re unsure if asbestos has been disturbed, the best course of action is to contact an asbestos abatement company such as ours. Our certified professionals will first arrange to test the material(s) in question to determine if there’s asbestos or not. If there is, the next step is to properly remove it from the structure. This is typically done by containing the source to avoid cross contamination, removing the bulk ACM(s) (asbestos containing material(s)), followed by thorough cleaning with a HEPA vacuum cleaner and other applicable (per situation) industry standard final cleaning methods. In some, cases encapsulating the ACM(s) is a better option. This is all carried out while wearing proper PPE (personal protective equipment). For more information on asbestos and asbestos abatement, contact us today. As qualified professionals in asbestos abatement, we’re happy to help answer any questions and clear up any misconceptions that may arise.